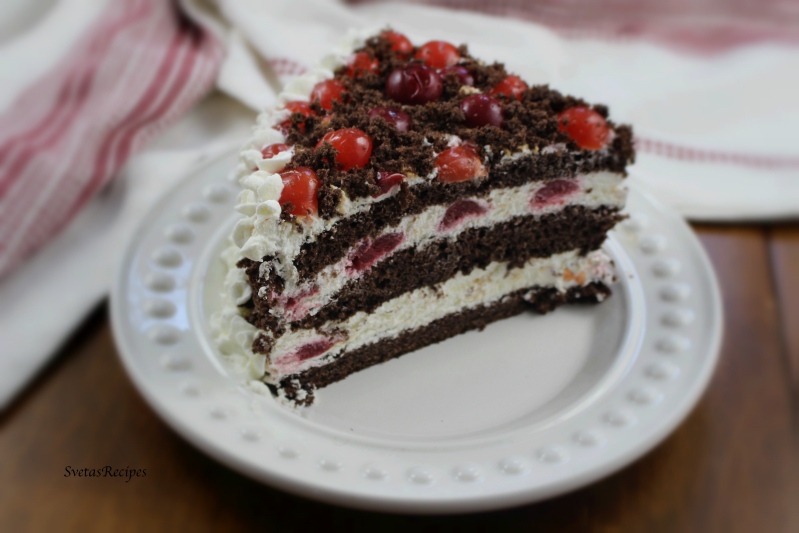 Soaked chocolate cake layers are sandwiched between a delicate cream frosting, Dulce de leech cream and sour cherries . Then covered with cake crumbs creating a snow flake effect. This cake delicateness. 1.) In a medium bowl add in 4 fresh eggs. Now pour your eggs into a mixing bowl, while mixing add your sugar, Mix until the it is soft. 2.) 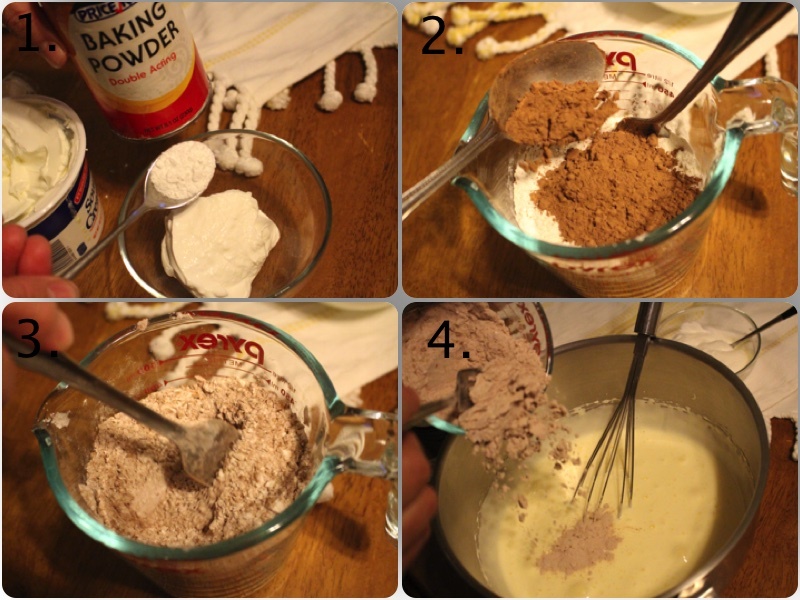 In a separate bowl add baking powder and sour cream mix together until the baking powder is dissolved. Combine sifted flour and cocoa powder. Add it to your egg mixture. 3.) 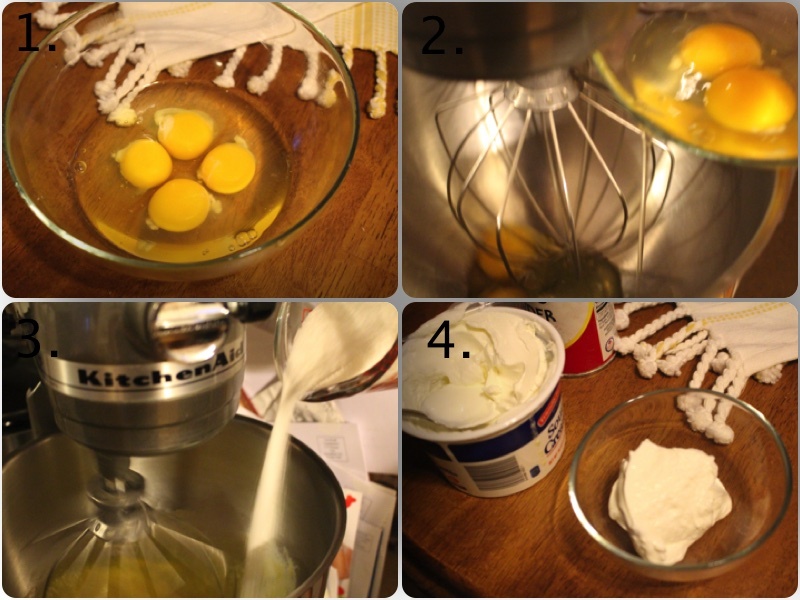 Add your sour cream mixture and condensed milk into your egg mixture and mix well. Pour in to prepared pan that has tinfoil around it, also spray it with cooking spray. 4.) Bake for 25 minutes on 350F. 5.) With a sharp knife split your warm cake layer into 1/2 horizontally. In a mixing bowl make whipped cream from heavy cream. 6.) Add your cherry juice into a spray bootle. Also spray every cake layer with it. 7.) 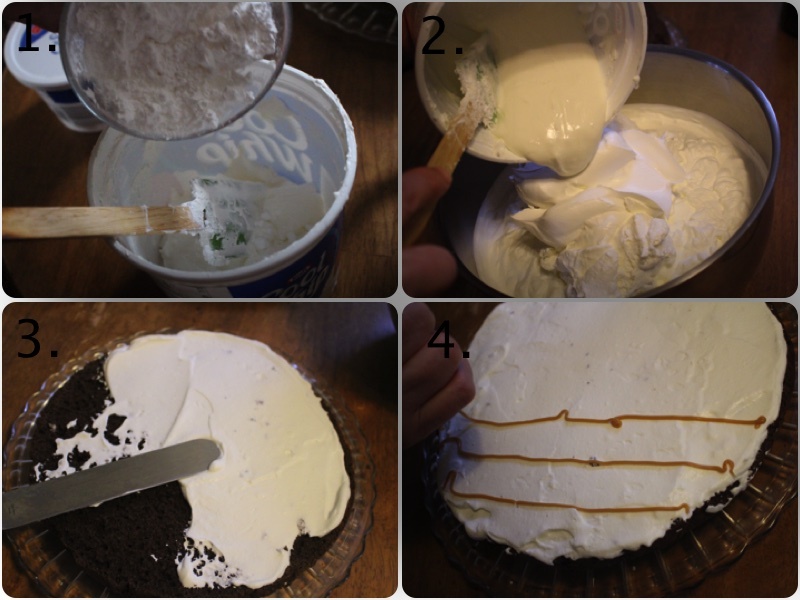 Add sour cream to your whipped cream and combine them together well. 8.) Add powdered sugar to your cool whip, now pour your cool whip mixture into your cream. With a spatula coat the cake layers. Using a ziplock bag with Dulce De Leche and a small hole, make horizontal and vertical line. 9.) Place a cherry into every cube on each layer. Then cover your cherries with cream. Repeat this process. Next ice your cake on the sides and the top. 10.) 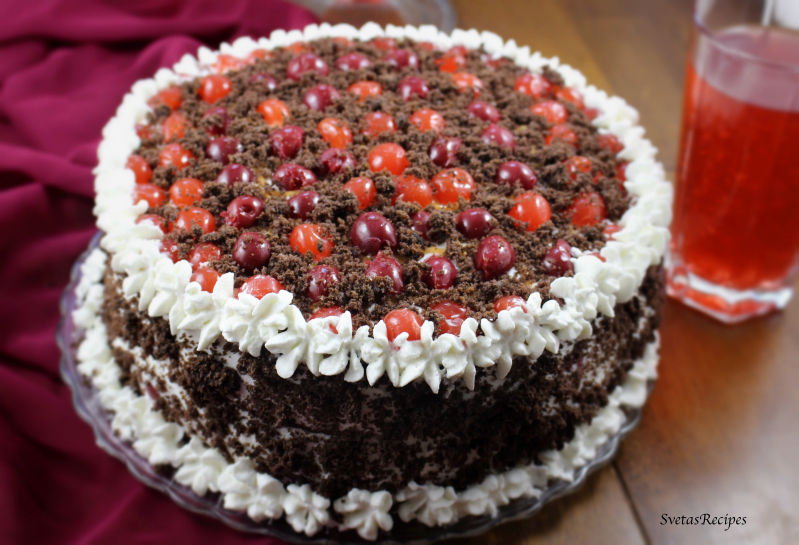 Shred one cake layer into crumbs and cover the top + the sides of the cake. Last But not least add horizontal and vertical lines on the top and place a cherrie in the middle of each cube, decorate. 11.) Place on a serving plate and enjoy! In a medium bowl add in 4 fresh eggs. 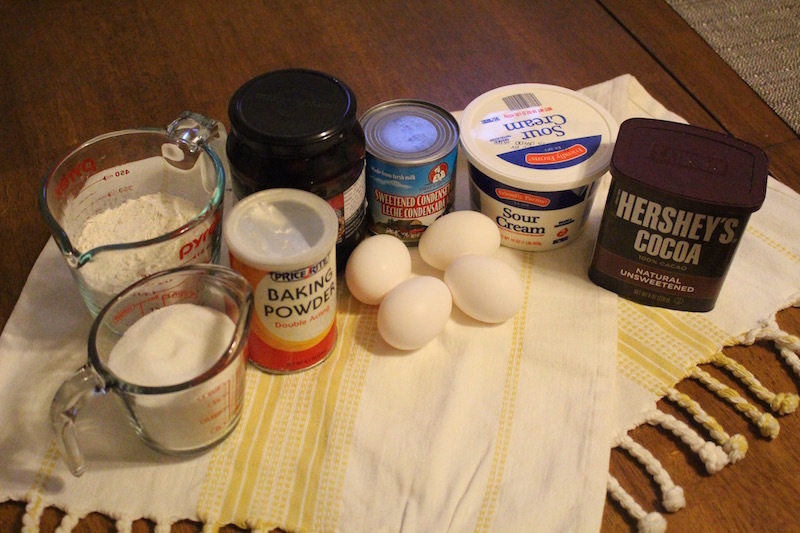 Now pour your eggs into a mixing bowl, while mixing add your sugar, Mix until the it is soft. In a separate bowl add baking powder and sour cream mix together until the baking powder is dissolved. Combine sifted flour and cocoa powder. Add it to your egg mixture. Add your sour cream mixture and condensed milk into your egg mixture and mix well. Pour in to prepared pan that has tinfoil around it, also spray it with cooking spray. Bake for 25 minutes on 350F. 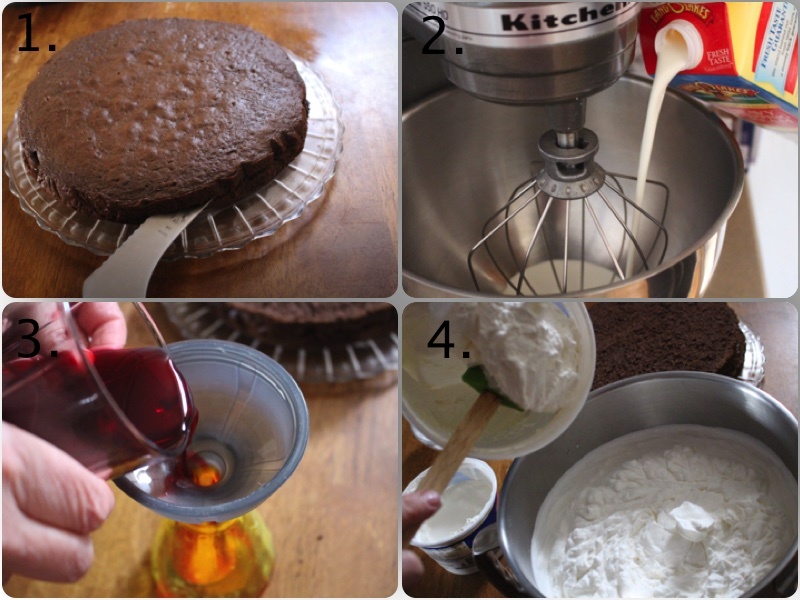 With a sharp knife split your warm cake layer into ½ horizontally. In a mixing bowl make whipped cream from heavy cream. Add your cherry juice into a spray bootle. Also spray every cake layer with it. 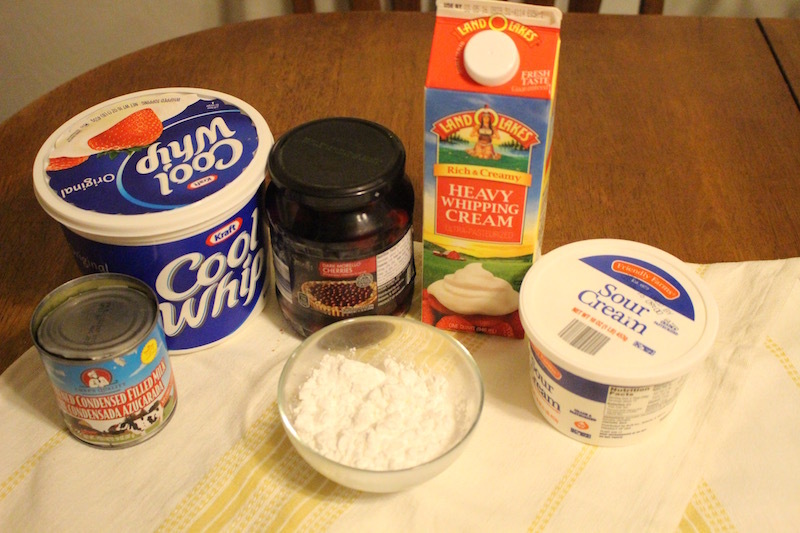 Add sour cream to your whipped cream and combine them together well. Add powdered sugar to your cool whip, now pour your cool whip mixture into your cream. With a spatula coat the cake layers. Using a ziplock bag with Dulce De Leche and a small hole, make horizontal and vertical line. Place a cherry into every cube on each layer. 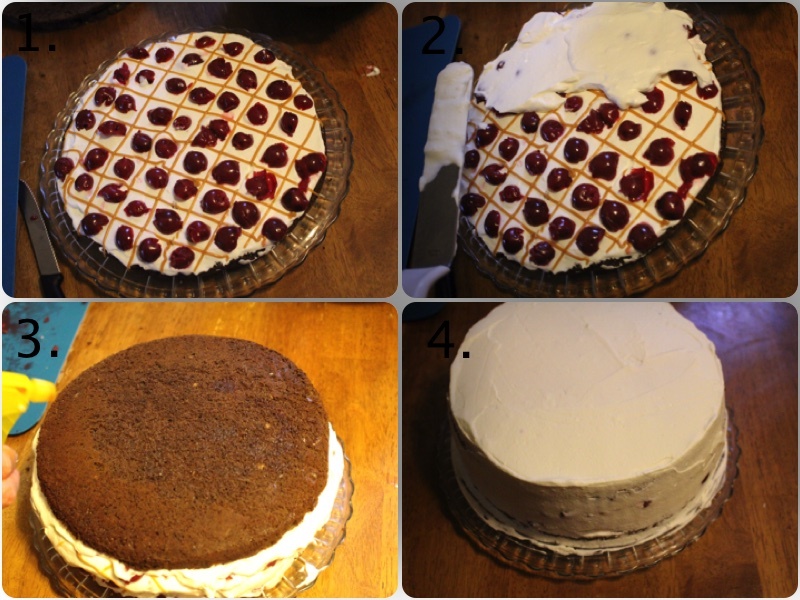 Then cover your cherries with cream. Repeat this process. Next ice your cake on the sides and the top. Shred one cake layer into crumbs and cover the top + the sides of the cake. Last But not least add horizontal and vertical lines on the top and place a cherrie in the middle of each cube, decorate. Place on a serving plate and enjoy! where does the dulce de leche come from? Are you saying to buy it?